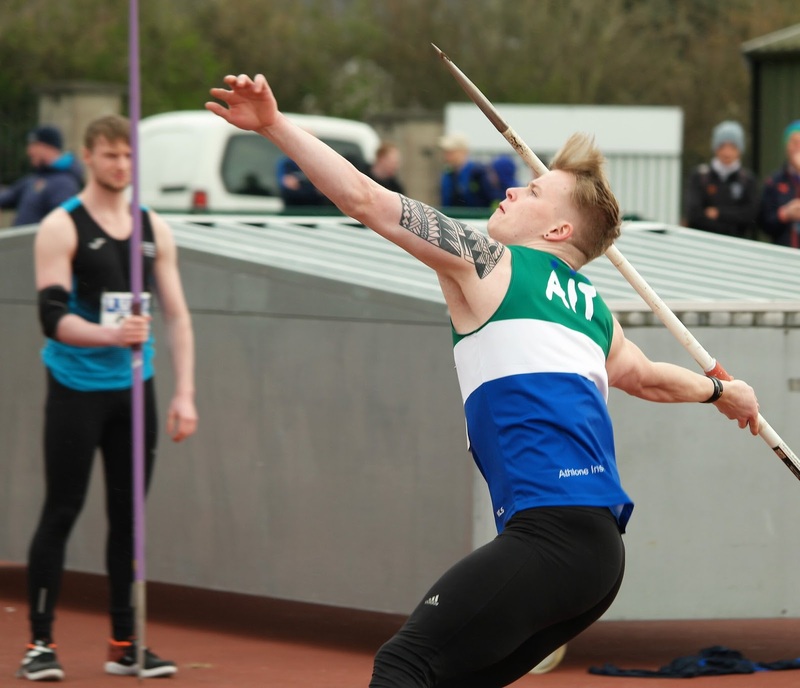 Athlone was definitely the place to be last weekend as the Irish Univerisity Track & Field Championships were held at the outdoor track on Friday and Saturday and the Indoor Arena saw the last day of the National Juvenile Indoor Championships. We had three members in action on Friday in the Varsities with Eanna Madden running a superb time of 21.67 to win his heat. With a slight twinge and very cold conditions, Eanna wisely decided to sit out the final but his time on Friday would have been good enough for a bronze medal. Cathal McElgunn went out strongly in the Men's 400m, clocking a time of 53.64 to finish fifth in his heat while he also ran a strong first leg for UCD in the 4 x 400m final on Saturday. Callum Whelan made a return to throwing and despite two marginal fouls in his first two effort, he threw 45.29 to finish ninth overall. Great to see the AIT student back in action. 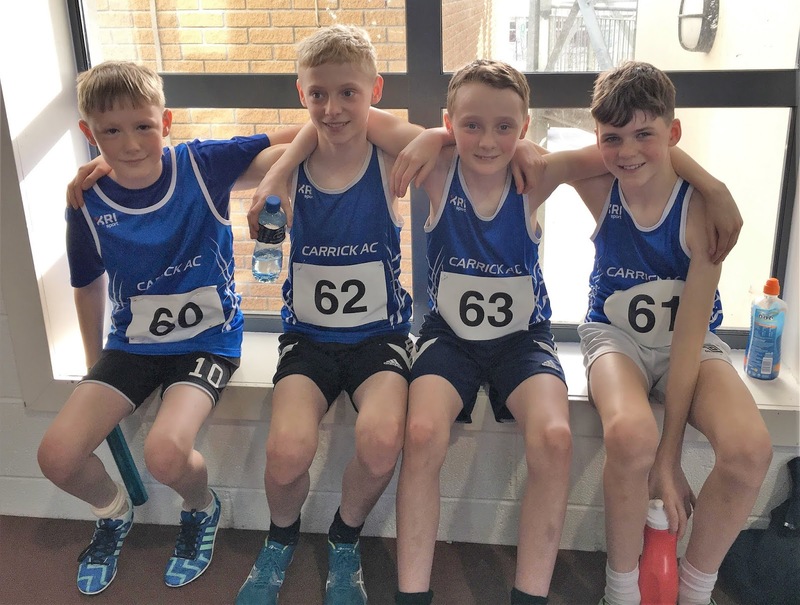 On Saturday, the Juveniles saw our U12 boys team turn in an exceptional performance to finish seventh overall in the 4 x 200m. Set up by an incredible opening leg from Luke Charles, the team led or were second for most of the first heat before being pipped for third. Luke's incredible opening leg put the lads in front, Riaghan Guckian was quickly passed but then stuck to the leader and was only a yard or two behind going into the change-over. Alexander Oates, making his debut in Athlone, stormed around the track to put us back in front while Nathan Casey ran a very strong leg and was right up with the winner all the way to the finish line. To put into context their performance, the lads ran a high 2.09 in the Connacht Finals but ran 2.01.89, eight seconds faster here. Jack Keenehan completed our weekend line-up as he competed in the U17 Long Jump. His best of 4.78m was down on his previous best but Jack will have learned a lot from the experience and will only get better. Finally, our U17 Girls team were unable to take part as injury and illness meant we were unable to take to the track. We wish Aine McGwynne a very speedy recovery from her broken wrist and we hope to see her back in action very soon. 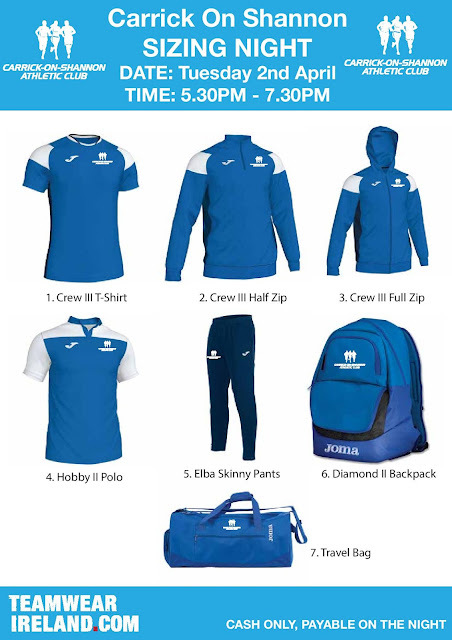 The Club are holding a Club gear sizing night in the Sports Complex next Tuesday, April 2, from 5.30pm to 7.30pm in association with Teamwear Ireland. Hard to know where to begin after another very successful, tiring and long weekend for the club's athletes and officials at the Connacht Athletics Indoor Championships in Athlone. With so many excellent performances in all age groups, it is hard to pick out one or two but we have to highlight two extraordinary runs from Toyosi Fagbo as he won the U16 60m and 200m. 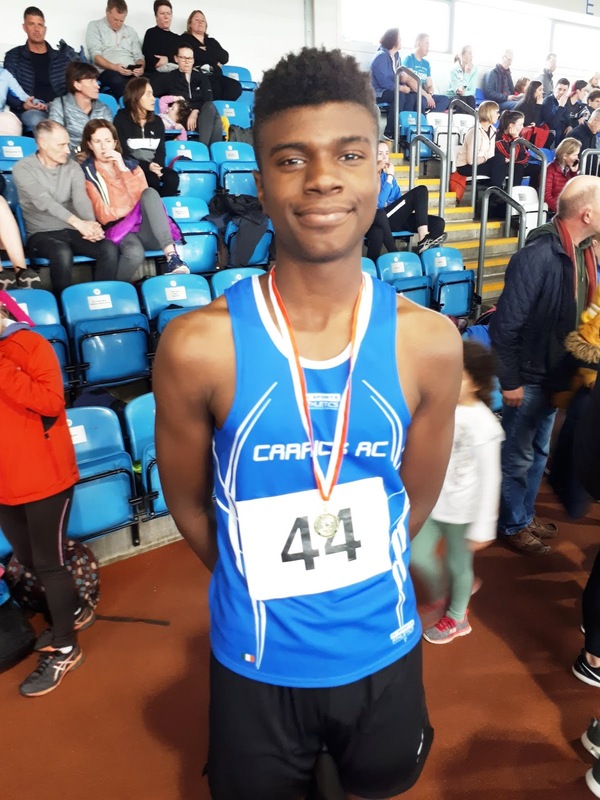 His 60m performance was simply on another level as he sped to a new personal best of 7.45 seconds in the U16 60m, his winning margin of over half a second the largest winning margin in any of the sprints over the weekend. Not only that, Toyosi’s time was only beaten by two Senior athletes and equalled by the U18 winner as the 15-year-old went on to make light of a poor lane draw in the 200m, his time of 24.37 more than a second clear of the field. 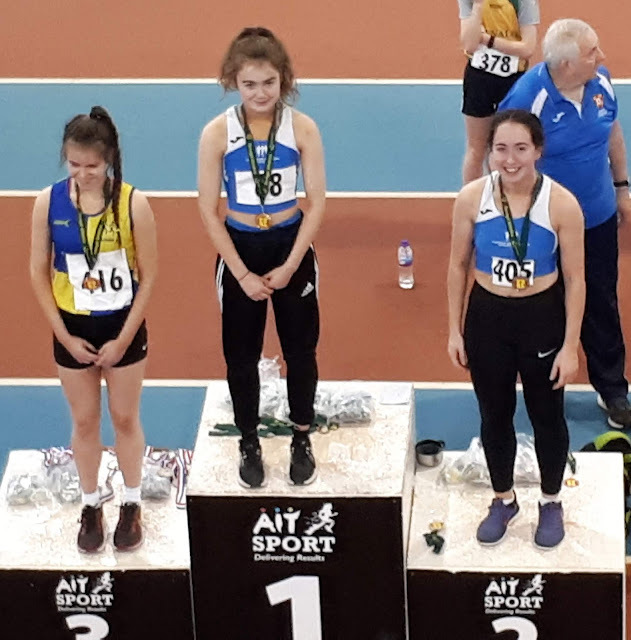 Ellis Conway was another double winner as she won the U19 400m and 800m, winning the shorter race in 59.98 secs before going on to win the longer race in her debut in the event in a time of 2.27.29, two very composed and impressive performances from Ellis. Unfortunately the 400m also saw one of our few low spots as Clodagh Sheerin suffered an horrendous hamstring tear midway through the race but she still finished in third place in one of the gutiest runs we've seen in a Carrick AC vest. Just in front of Ellis at the halfway point, Clodagh badly tore her hamstring but completed the entire race, finishing in agony in an incredible display of pain tolerance. 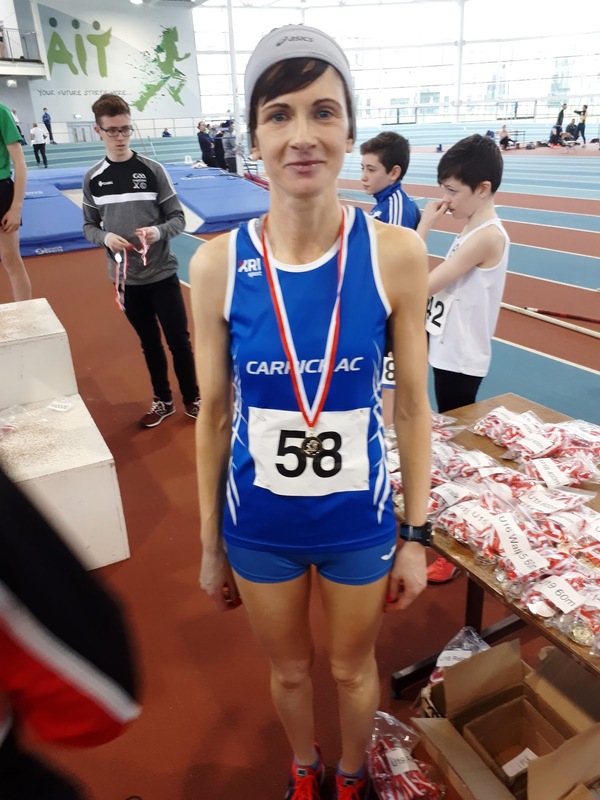 Our Masters athletes were also in superb form - International Michelle Lannon ran a superb 10.55.66 to finish fourth overall in the 3,000m and first master while Ann Wynne led Susanne O’Beirne in the 800m and 1,500m but both picked up golds in the W50 and W35 categories, Susanne also winning silver in the 400m. Our final masters athlete saw Ken Kennedy set a new personal best with an impressive 10.05. His sons were in good form too as we had the unique honour of winning all three heats in the U13 600m. Declan won the first heat in 1.45.56, Patrick went slightly better with 1.44.60 to 1.46.56 before Cathal Enright won the final heat in 1.48.42, giving up first, third and fifth in the event. 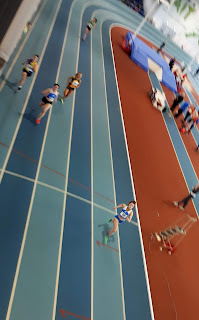 A badly timed muscle strain during the week meant we didn't get to see the best of Alannah McGuinness in the U18 60m but she still ran her fourth fastest time ever of 7.88 despite never really getting going in any phase of the race, perhaps a sign of what she can do when fully fit. 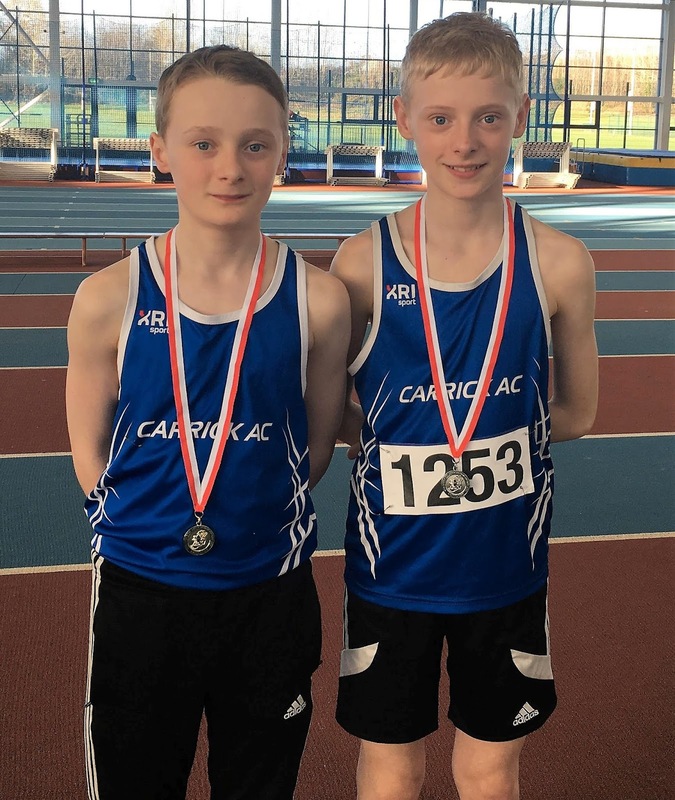 Luke Charles followed his brothers Oliver and Patrick as Connacht medalists with a superb silver in the U12 60m in a time of 8.76 and he then teamed up with Riaghan Guckian, Nathan Casey, Eoin McGowan and Kyle Lannon to take third in the U12 relay, pipping Sligo AC for the bronze medal by one hundredth of a second, all four runners putting in amazing legs. Our U17 Carrick girls team of Aine McGwynne, Alanna Murray, Lauren Reynolds and Sophie McCabe finally got their hands on a Connacht medal as they finished second in their event with a time of 1.53.85 with Aine still getting the baton to Alanna despite a spectacular dive at the line and Lauren doing another spectacular leg on the third leg. Jack Keenehan produced the goods at the right time as he leapt to 5.01m to take a bronze medal in the U17 boys long jump. 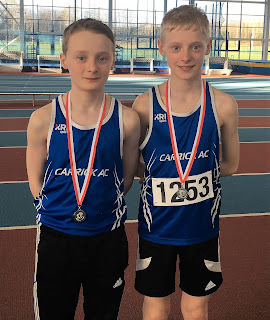 That completed our medals for the weekend but there were some excellent displays over both days with Paul Lenehan and Cian Mollohan both fourth in their events while the U12, U13 and U14 Girls relay teams all put in very good performances. Emma Clarke also marked her Connacht debut with a fine eighth place in the U15 Girls 60m in a time of 8.69 seconds. Thanks to all the parents who brought the athletes and really supported them on the day, to Jenny McCabe for looking after the numbers, to officials Siobhan Whelan, Siobhan Murtagh and John Connolly for their work on the day but especially to all our athletes who performed so well in the Carrick AC vest over the two days. Just a quick note to wish all our athletes in action this weekend in the Connacht Indoors in Athlone the very best of luck over Saturday and Sunday. 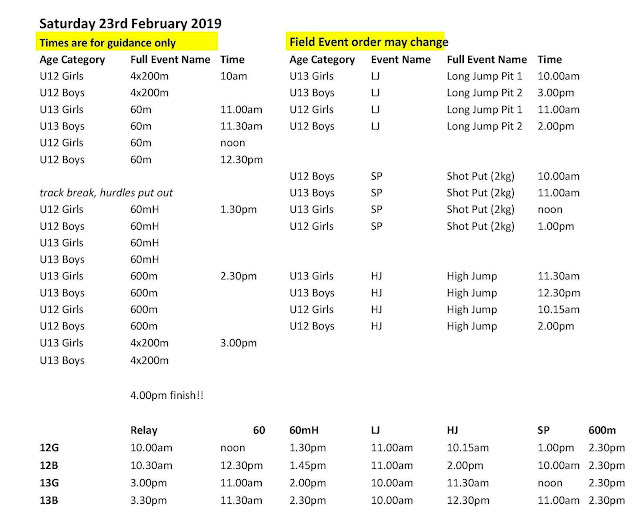 On Saturday, it is the turn of our U12 and U13 athletes to compete. 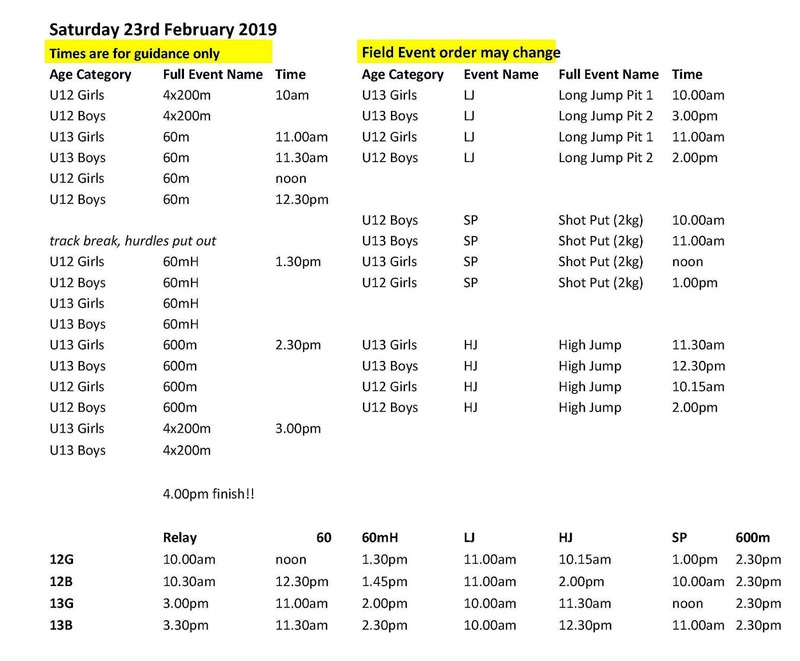 Organisers have asked everyone to note that due to the large number of entries in the U12 Girls and Boys relays, assembly for the girls event will take place on the inside track at the end of the sprint lanes at 9.30 am sharp so all members of our U12 Girls team must be down in plenty of time to do their warm-up and be ready for assembly. 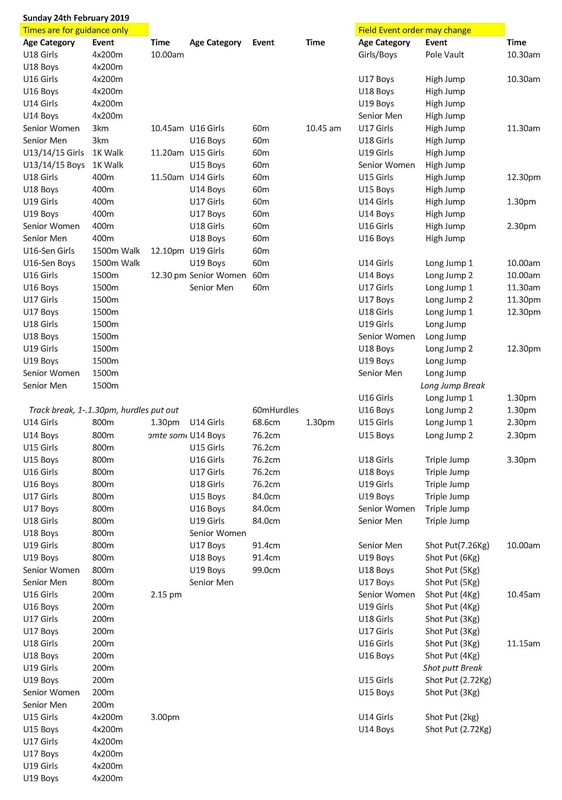 On Sunday, our U14 athletes right up to Masters will be in action - organisers have asked those competing in 800m events to note that the order of the 800m has been reversed in the updated programme. 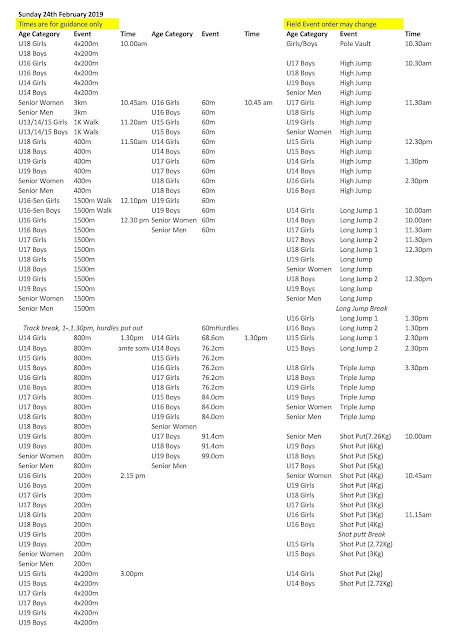 So instead of starting with Senior and working down the age groups, the 800m races will start with U14 and work up. The correct timetable is below. We have also been asked to tell everyone that no food or drink, apart from water, is allowed to be consumed in the Indoor Arena on both days and that the canteen will be open on both days. We're in the last days of 2018 with a New Year soon upon but our members finished the last year strongly with some very good performances at the North West Games in Athlone IT last Saturday. Superbly organised by Athletics Donegal, the event was a Christmas feast of athletics with events in all age groups and some great performances from Carrick AC athletes. These ranged from two wins for Alannah McGuinness to the Kennedy brothers putting on a show that had the crowd rising to their feet, applauding them down the home straight as they ran side by side from start to finish, Declan just edging Patrick in the finish. Ellis Conway put in two very solid performances over 200m and 400m while Oisin O'Dowd set two new personal bests before he heads back to Holland for his studies and Oisin Kearney also set a big new pb over 400m. Oisin Kearney and Susanne O'Beirne were also among the winners so well done to everyone who took part. Carrick-on-Shannon Athletic Club are delighted to announce that we will hold our Registration Night for both existing and new members at 7.30 pm on Monday, January 7, 2019 in The Bush Hotel in Carrick-on-Shannon. This Registration night is for ALL existing members - Juvenile to Senior to Master. Anyone not registering on the night will not be registered with the Club for 2019 even if you have been a member up to the end of this year's activities. We are also pleased to announce that we will be accepting a limited number of new members in our Primary School group, subject to safety limitations for the Sports Complex, as well as new members in all other groups. We will also be accepting new members for our eight year old group that meets on Thursday evenings in the Sports Complex. This group is limited and a child must be age eight on the night of registration to join. The Athletics Ireland Registration year runs from January 1, to December 31, of each year meaning our membership year will run for the same period. Please remember, a parent must sign the membership form of their child under 18 years of age. We look forward to seeing everyone on Monday, January 7, in The Bush Hotel. We hope you all have a Merry Christmas and Happy New Year. 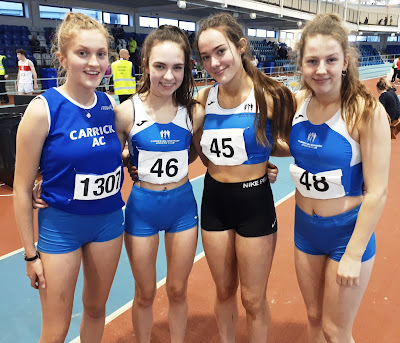 The first indoor competition of the year saw some great performances and a lot of personal bests from the small Carrick AC crew who took part in Wednesday's Baseline Meet in Athlone. Gerard O'Donnell started his indoor season off impressively with a 7.15 clocking over 60m, finishing second in the race, before winning the 150m in a time of 16.51 seconds, a very smooth and controlled run. 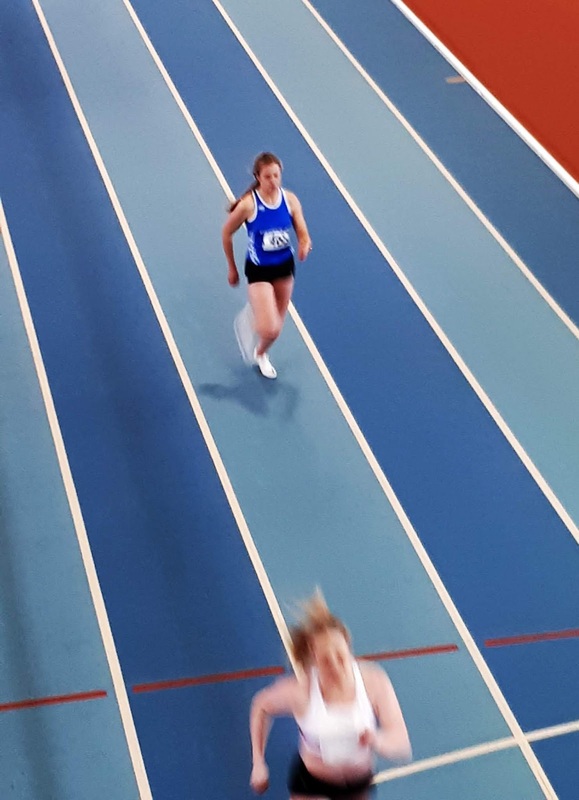 Alannah McGuinness smashed her 60m personal best by 0.13 of a second when she finished third in the 60m in a time of 7.86, a great start to the indoor season. She followed that up with a superb new pb over 150m, which again equates very well to her best over 200m. Clodagh Sheerin was third in the 150m race with Alannah second, in a time of 20.4. This came after Clodagh was a very impressive winner of her 60m in a time of 8.35 seconds. 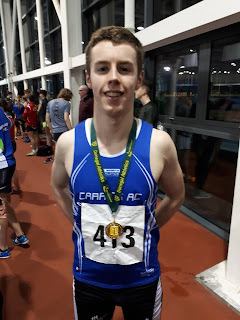 Oisin O'Dowd was another smashing pbs as he ran 7.62 for 60m and 17.93 for 150m, a time nearly a second faster than he ran last year, with Niall Sheerin running 7.84 over 60m and 18.38 over 150m. Ellis Conway finished third in her 300m in a time of 42.97 in a tough field while Oisin Kearney won his 300m heat in a time of 38.81, a superb run and then running 18.57 over 150m. Well done to everyone on a great start to the indoor season. Carrick-on-Shannon Athletic Club was founded in October 1973 and serves the areas of Carrick-on-Shannon, Leitrim Village, Gowel, Kiltoghert, Jamestown, Kilnagross, Cortober and parts of North Roscommon.